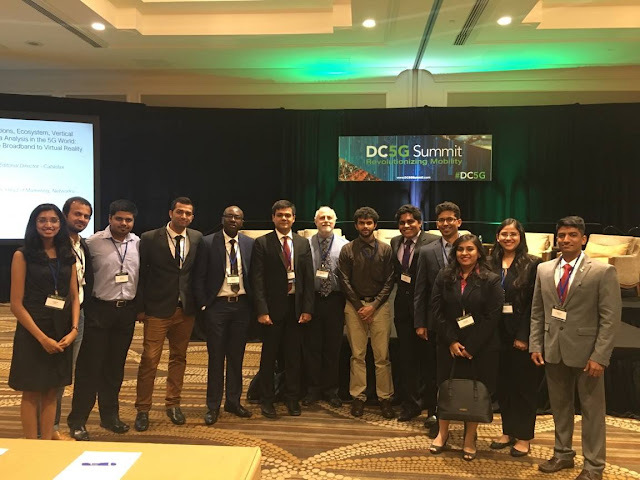 Students of the “DAS and Small Cells” course, led by Prof. Rikin Thakker, got an opportunity to attend the DC5G Summit, held on October 11, 2017 in Washington D.C. They were also accompanied by the Associate Director of the MS in Telecommunications course, Dr. Michael Dellomo. The following students attended and contributed to the “Key Takeaways” mentioned in the slides provided here. Abiodun Adewuyi, Swanand Bhave, FSC Clement, Mohini-Anne D’souza, Alekhya Dixit, Kaushal Dubey, Meghan Kachhi, Jason Miranda, Eshan Mulay, Rugved Nadkarni, Omkar Patil, Swapnil Prajapati, Sankalp Samant and Deepika Vaidya. The event brought together industry professionals and visionaries from various fields of the Wireless Broadband Ecosystem. A series of interactive discussions by diverse panels and Key Note speakers focused on a comprehensive Rollout Strategy for 5G. Chris Pearson, President of 5G Americas, in his opening key note, presented a ground plan of the economic potential of 5G connectivity and detailed the market update on the transformation of Mobile Wireless Networks to 5G. Sue Marek, VP of Content and Editor-in-Chief SDxCentral led the first panel discussion on Coverage, Connectivity, Strategies and Vision for 5G Roll-out with executives from AT&T, CommScope, Crown Castle, Ericsson and LeoSat.. The question answer session was very insightful, and brought out the true purpose of evolution of cellular technology standards with the Wireless, Cable, Satellite operators and Telecommunication Equipment Manufacturers agreeing to high capacity and low latency requirements for 5G Use Cases. Deployment of 5G is aimed at achieving duality by routing control information through existing macro towers and data traffic through the newly evolved 5G network. Further, the panel examined different economic models to support 5G infrastructure that promise to reduce cost per bit by achieving higher spectral efficiency. David Orloff brought perspective to network slicing, commercialized solutions for mmWave spectrum, interference management and network virtualization for a cost-effective solution. With strategies for 5G deployment and Applications of 5G in the wireless Ecosystem defining high bandwidth requirements, Dr. Preston F. Marshall, Principle Wireless Architect, Google emphasized the importance of shared spectrum and shared Infrastructure as a path to 5G. He presented the idea of moving to shared and common spectrum allocation instead of exclusive and non-exclusive spectrum allocation methods, while explaining how partnering and managing co-existence can lead to neutral host advantages. After a power lunch, Chris Pearson, President of 5G Americas led the discussion on 5G for industry - Software Defined Networks, Automation, and Computingat the Edge. Professor Rikin Thakker was one of the panelists. Other panelists included experts from Hewlett Packard, Edgeconnex, and Oceaneering. The panel discussed ways to share infrastructure and how spectrum should be prioritized, e.g. OEMs like Ericsson are providing shared infrastructure solutions for small cell and CBRS has opened possibility for spectrum sharing. Decentralized/Distributed Computing, Network Edge and Cloud Edge will play an important role in 5G. Cloud datacenters, NFV (Network Function Virtualization) and SDN (Software Defined Networking) will be important elements of 5G. 5G should be focused on Efficient and Dynamic use of resources which will allow operators to allocate on demand resources based on application (High/Low Speed, High/Low Latency, High/Low Bandwidth) and provide “5G as a Service”. 5G standardization should be based on whole Industry and not specifically for MNOs. Howard Buskirk, Executive Senior Editor, Communications Daily, directed the session 5G's Biggest Challenges: Security, Privacy, Bandwidthand Regulatory Barriers where executives from NTCA, Dynamic Spectrum alliance, EchoStar Corporation and Federated Wireless shared their understanding and assessments of the challenges ahead. The engaging panel discussion concluded that the main challenge for 5G in generating revenue was to create excitement to generate revenue for 5G deployments. A potential revenue driver would be neutral host model and shared spectrum model.Also, emphasis on interoperability was underlined in-order to accomplish a network of networks design in 5G. “Our sincere thanks to the event organizers and especially to Jeffrey Hill for allowing our students to witness the dynamic conversation about the 5G developments. The event covered many key aspects of 5G ecosystem – Spectrum, NFV, C-RAN, Small Cells to name a few. Our students thoroughly enjoyed the event and gained better understanding on how various companies play vital role in fueling the innovation.” -Prof. Rikin Thakker, Faculty at M.S. in Telecom Program. 5G Evolution and development is use-case driven. Use-cases must effectively break vertical silos in business-to-business solutions. Virtual reality, although an independent technology, needs high data performance network to penetrate wider markets as a service. Many companies are working with Universities and City councils to expand the reach of knowledge about the umbrella of products under 5G and their utility to civil and corporate applications. Big data analysis coupled with mobile edge computing delivers better experiences in deployment. Mobile edge computing is distributing processing power. That includes faster processors and memory organization in smartphones as well as cloud architecture to support massive data collection and content delivery. Introduction of advanced applications in the market can be successful only by a well-planned ecosystem-wide impact. Companies are focusing on identifying value along the complete chain and creating an educated market segment. For more TSAN news and updates, follow us on Linkedin.